The Lankan Lions made their presence felt while beating Australia by a huge margin of eight wickets and registered their first victory in the Commonwealth Bank Series One Day International tournament. The match was restricted to 41 overs a side as rain disrupted the play in between the Aussies innings who were bowled out for 158 runs with one ball to spare. 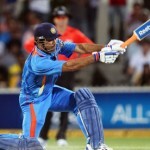 The Islanders achieved the revised target of 152 runs for the loss of just two wickets in 24.1 overs. Thisara Perera was declared ’Player of the match’ for his excellent fielding as he was involved in two run outs and held two wickets. The match was played on February 17, 2012, at the famous Sydney Cricket Ground. Earlier, the stand in Captain of Australia, Ricky Ponting, won the toss, elected to bat first as David Warner and Matthew Wades opened the innings. The batting was initiated with caution but the Lankan bowlers invaded with a valid support from their fielding. Both of the openers were sent back to the pavilion and the misfortune was added when the poor run of form continued for Ponting who was gone for two runs and three wickets fell down for 37 runs. The lean time for the Kangaroos batsmen continued as two more wickets were lost at the total of 74 runs in 20.3 overs. The last recognised batsman, David Hussey came in next and got a life on eight runs when he was dropped by Lasith Malinga off Perera. The wickets kept on crumbling at the other end as Hussey tried to give some respect to the total. The lady luck followed him as he was again dropped at short extra cover by Angelo Matthews off Malinga at 31 runs. Hussey went on to score 58 runs as the whole team was bundled out for 158 runs in 40.5 overs. Farveez Maharoof and Perera were the highest wicket takers with two each as Malinga, Mathews and Rangana Hearath shared one wicket each. The Sri Lankan Captain, Mahela Jayawardene, promoted himself in the batting order and opened the innings with Tillakaratne Dilshan as Brett Lee opened the attack after his absence from few matches. The duo initiated with aggression and Dilshan looked in a dangerous mood as he dispatched a six to Mitchell Starc in the fourth over. He continued his ambush and sent the ball rolling out of the fence for three consecutive balls of the next over off Lee. The first fifty of the innings was completed in the eighth over as Dilshan lost his wicket when he edged a ball and was caught in the slip by David Hussey off Clint McKay for 45 runs scored on 41 balls with one six and 4 fours. The first wicket contributed 74 runs in 11.4 overs as the experienced Kumar Sangakkara took guards, started from where Dilshan left and Jayawardene kept on adding useful runs at the other end. The prominent Sangakkara obtained a milestone in his career by smashing 10,000 runs in the One Day Internationals as he stole a single on the fifth ball of the 18th over. He added 59 runs for the second wicket and was gone after scoring quick fired 30 off 29 balls with the assistance of one six and 4 fours. Jayawardene remained unbeaten on 61 off 67 balls with 5 fours as the Islanders reached the target of 152 runs after losing mere two wickets with 16.5 overs to spare. Sri Lanka won the important match by a grand margin of eight wickets, earned a bonus point as well which has brought them back in the competition. Sri Lanka played like a champion team. Their all round performance was at the peak. And unlike India they didn’t drag the match to the last over. Dhoni, learn something from your neighbours. Kumar Sangakkara just doesn’t stop scoring; he is like a timeless scoring machine. Good that srilankan team could register a win at this moment. They came very close last time they met indians. Their two good winnings over last two games against Australia and India were very encouraging. Mahela jayawardana has yet lot to offer it seems. It is good for him, sri lankan cricket team and most importantly for sri lankan cricket. It does not matter whether they win the trophy or not, but playing good cricket is what matters the most.